Axel Douque at Ocean Independence tells me that he's closed on the sale of the 34.95m motor yacht Symphony, in an in house deal with Jeroen Minnema representing the buyer. 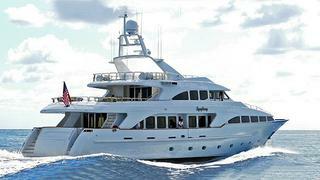 She was jointly listed for sale with Mark Seaton at Yacht & Villa and is a Benetti Classic 115 built to ABS class in 2000 to a design by Stefano Righini as the seventh in this series with a full displacement hull and bulbous bow. The interior design by Francois Zuretti accommodates 10 guests in five staterooms - all with en suite bathroom facilities - and there is extra bed space in the saloon and skylounge, increasing the sleeping capacity to 14. Symphony was asking €4.95 million.